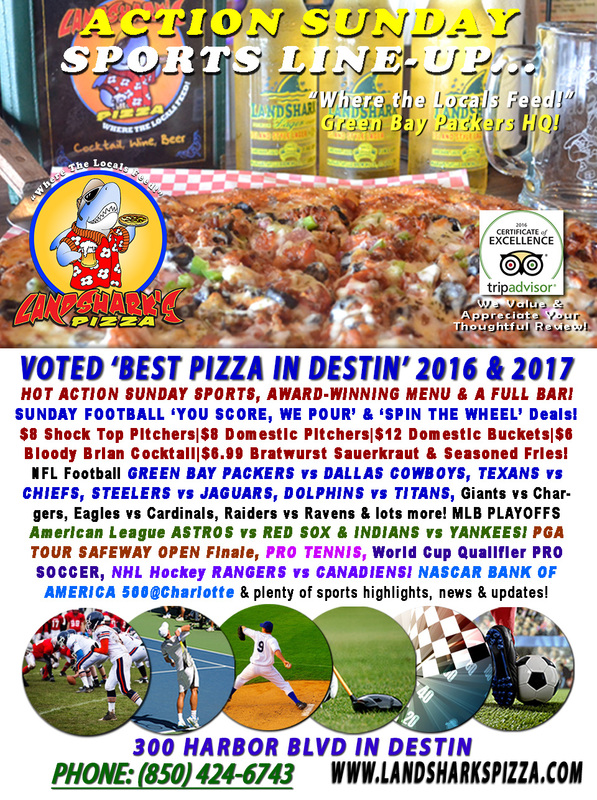 / Best Calzone in Destin FL / Sunday MLB Playoffs, PACKERS vs COWBOYS|YOU SCORE, WE POUR Specials, NASCAR Bank of America 500 & LOTS More! 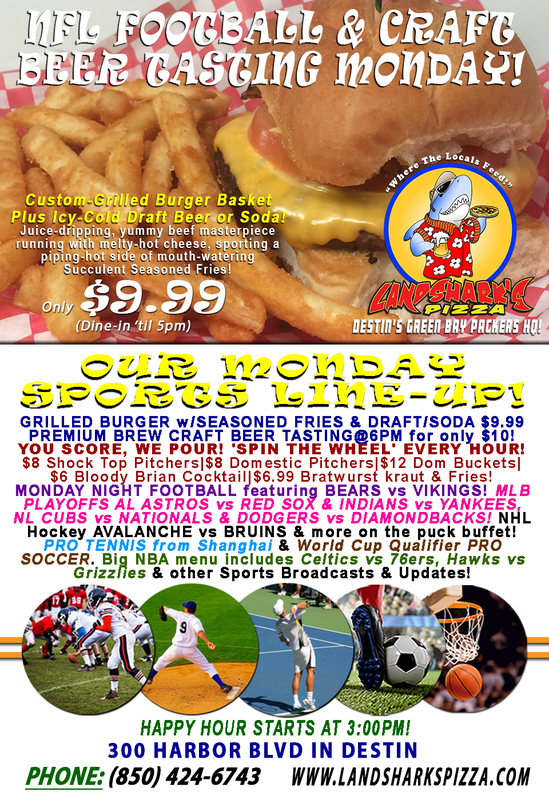 Sunday MLB Playoffs, PACKERS vs COWBOYS|YOU SCORE, WE POUR Specials, NASCAR Bank of America 500 & LOTS More! Brave the refreshing light breeze outside (carefully, of course) and come on down to Landsharks for YOU SCORE, WE POUR! Wear your favorite team’s jersey and win a FREE BEER POUR with every touchdown! ‘SPIN THE WHEEL’ DEALS Every Hour! 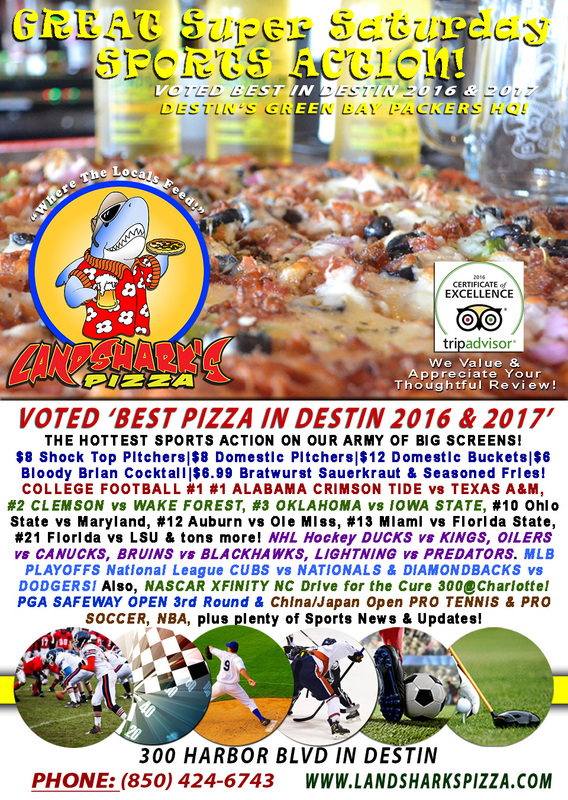 Super Sports Sunday MLB Playoffs excitement continues along with NHL, NBA, Tennis, Soccer and the ‘BEST PIZZA IN DESTIN’ (Voted 2016 & 2017! ), a belly-busting menu of delicious eating from Award-Winning Wings, Oven-Baked Subs & Calzones to The Best Traditional BBQ, loads of appetizers, and A FULL BAR! SPORTS ON OUR ARMY OF BIG SCREENS – Pro Football GREEN BAY PACKERS vs DALLAS COWBOYS, TEXANS vs CHIEFS, STEELERS vs JAGUARS, DOLPHINS vs TITANS, Giants vs Chargers, Eagles vs Cardinals, Raiders vs Ravens & LOTS more! MLB Playoffs American League ASTROS vs RED SOX & INDIANS vs YANKEES! NHL Hockey RANGERS vs CANADIENS. PGA SAFEWAY OPEN Finale! NASCAR Monster Energy Cup Series BANK OF AMERICA 500@Charlotte. NBA Lakers vs Kings, Cavaliers vs Wizards & more! China & Japan Open PRO TENNIS and World Cup Qualifier PRO SOCCER & plenty of other Sports Broadcasts, Sporting News, Analysis, and Commentary! Previous Post: « Landshark’s COLLEGE FOOTBALL FEAST SPECIALS, #1 BAMA vs TEXAS A&M|NASCAR, PGA, NHL Throwdowns!